I have recently gotten a lot of questions about my cuticle care routine and about the process of painting my nails. I thought that I would make an all in one post talking about the up-care for my nails and my step by step process to get a clean looking manicure. Check it out below! I have been getting a lot of requests lately about what some of my favorite products are and what I think every nail artist should have in their tool box! I have compiled a post below that lists out all of the items that I keep in my nail kit so that you can see the products that I use day in and day out to keep my nails looking good! I have included links so that it will take you directly to the site to purchase each product if you are interested! This is a photo of my actual nail kit! I use a Caboodle that can be found at TJ Maxx, Ulta and Target! I love it because it folds out into three tiers on each side and has one big base on the bottom. This means that there is an ample amount of space for storage! I also love how this kit folds up and locks with a handle at the top so that I can bring it with me if I am doing nails at someone else’s house/area! I recently asked you guys to send me some of the questions that you have been wanting to ask so that I could make one big post answering them all. 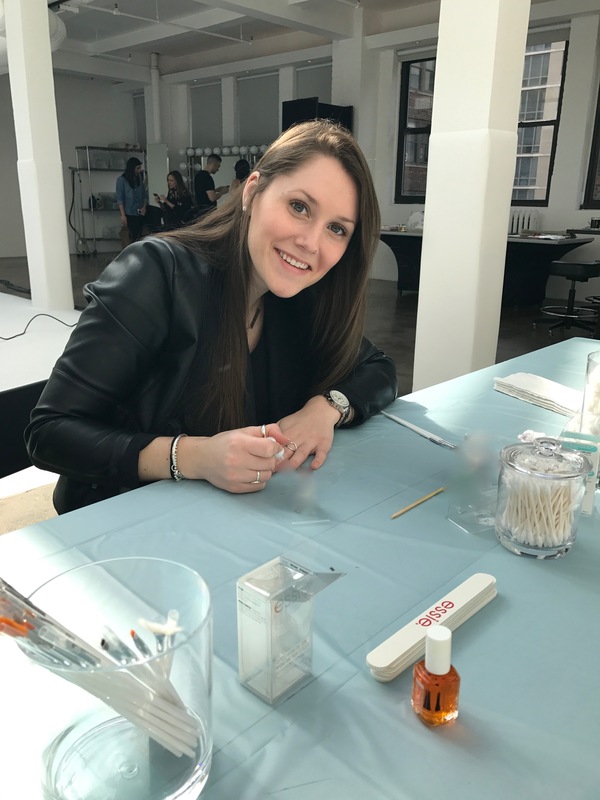 One of my favorite things about ‘essiebuff’ is that I can help those who may just be starting in the nail world or do not know much about it and give them insight on particular topics. This post was by far one of my favorites to write as I loved all of the feedback and questions that I received. Thank you to those of you who sent me questions! I spent my day off on Saturday running errands around town. I decided to stop at my local Marhsall’s to peruse the nail polish section. I am an avid collector as most of you know and this means that purchasing polish can get expensive. This is why I go to Marhall’s and TJ Maxx in order to get good deals and find polishes that I sometimes wouldn’t be able to find elsewhere. This trip was unlike any other as I stumbled upon six essie polishes that I had never heard of before. This normally doesn’t happen to me as I try to stay as aware as possible about past releases, current releases, and future releases. These polishes truly had me baffled so I decided to google the names to see what came up…when nothing appeared I was even more confused. Once I looked at the number on the bottom and noticed that they were in the 7000’s a red flag came into my head and I was even more concerned that something might not be right. I walked around the store and contemplated whether or not to buy the polishes for quite some time before I finally decided to purchase them. My thoughts were that I could always return them if they turned out to be something I wasn’t interested in or that I would have made a great purchase if they were a discontinued or rare/hard to find polish. Little did I know this was about to turn into an essie investigation! Below are the six mystery polishes! From left to right: ‘Meet & Treat’, ‘Social Butterfly’, ‘Follow The Leader’, ‘It’s Complicated’, ‘Office Crush’, and ‘Bring Your “A” Game.